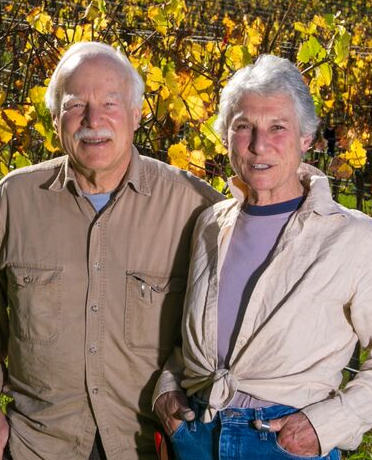 With multiple research, teaching and consulting careers behind them, Glen and Pamela Gunsalus set out to plant a small hillside vineyard located west of Graton in Sonoma County with the goal of being sustainable. The couple purchased 21 acres in 1990 on Upp Road in West County and moved to the property in 2000. 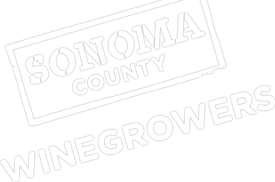 Their vineyard lies within three AVAs (Russian River Valley, Green Valley of Russian River Valley and Sonoma Coast) and is divided into one-acre blocks planted with four Pinot Noir Dijon clones. Green Valley Creek borders the property, so there have been several opportunities to work with local groups for wildlife habitat and creek enhancements. An early project supported by Trout Unlimited and Fish and Game involved bank restoration and Coho salmon habitat improvements. The Russian River Coho Salmon Breeding Program took salmon from their stretch of the creek to stock the Warm Springs breeding program and each year releases fingerlings and monitors their outcomes. A recent project to repair many years of erosion to an ephemeral stream along one side of their vineyard which empties into the Green Valley Creek was a collaborative effort with the support of GoldRidge Resource Conservation District, Sonoma County Fish and Wildlife Commission, USDA/ NRCS, and a local environmental engineer and a construction firm. “Fill was brought in and compacted, rocks were positioned to channel the stream, and to provide habitat for wildlife and erosion control, and we planted more than 100 native trees, shrubs and ferns along the banks,” Glen said. The Gunsalus’ farming approach is to be economically and environmentally sustainable using best management and least invasive practices. They perform most vineyard tasks by hand – pruning, canopy management, as well as, control of soil erosion, weeds, gophers and other pests. Over the years they have removed non-native/invasive plants, such as Himalayan blackberries and Vinca, and maintain good habitat for beneficial insects by encouraging the growth of native flowers, such as Queen Anne’s Lace, and planting shrubs (e.g., Rosemary) to attract bees and beneficials. The couple adhere to a no-till practice to reduce erosion and encourages the growth of natural vegetation. The vineyard is Fish Friendly Farming Certified which addresses important watershed and ecology issues, however, currently does not meet several other sustainability concerns, such as, air quality, labor and community relations, and economics. Pamela and Glen believe these issues are important for their vineyard’s sustainability.